If the staff at the Poisoned Pen learned anything last Friday night, it was not to trust the number of likes on their Facebook page. Denis and I showed up early, as is our habit, and I overheard one staff member say to another that they were expecting 40 people because that's how many people had responded to the Facebook announcement. As I snatched up my copy of The Woman Who Died A Lot (Jasper Fforde's latest Thursday Next adventure) I thought that number was a bit low, especially since Denis and I were there and neither of us had clicked that infamous like. I was right. I bought my books (didn't think I'd walk out of my favorite bookstore with just one book did you? ), took a seat in my favorite spot, and proceeded to read. I didn't get very far because my need to people watch overcame my need to read. More and more people came in the bookstore. Staff members hustled putting out more chairs. More people came in. More chairs were put out. By the time the guest of honor arrived, it was pretty much standing room only in that small bookstore. Who Killed Humpty Dumpty was his first book, one that-- as he told us-- "I thought could sell by the title alone." 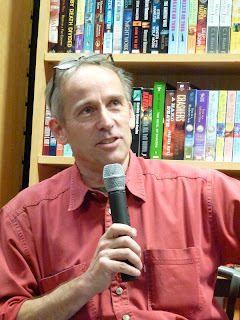 Although this first book later became The Big Over Easy, Fforde finally reached a point where he didn't care anymore: "This is clearly going to be a hobby for the remainder of my days, so I'm going to write whatever I want!" Whatever he wanted turned out to be The Eyre Affair, the first Thursday Next book and a bit of a publishing phenomenon because not only was it well-received in the UK, it flew across the pond and became popular here in the United States. 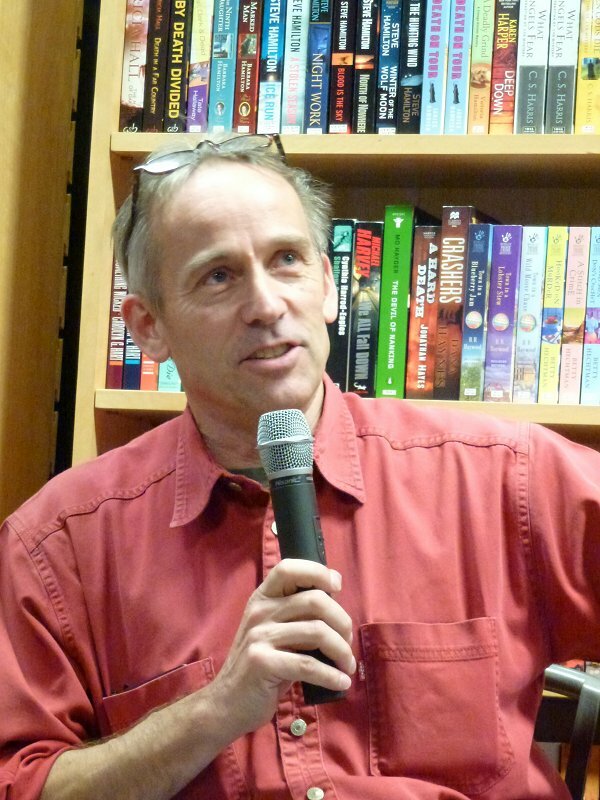 "If I'd been sitting here staring at the ceiling..."
Fforde's publishers were over the moon about the reaction to (and the sales of) The Eyre Affair and kept asking Fforde "Don't you know how amazing this is?!?" to which he would reply, "Jolly good." He had no idea of how rare it was for a debut British author to be in the top ten on the New York Times bestseller list during the first week of publication. Inevitably talk began of a sequel. At his first meeting with the people at Hodder, they asked him all sorts of questions that he'd just answer yes to. Are you going on tour? "Yes, love to!" Will there be a sequel? "Yes, of course!" What will the title be? "Lost in a Good Book?" 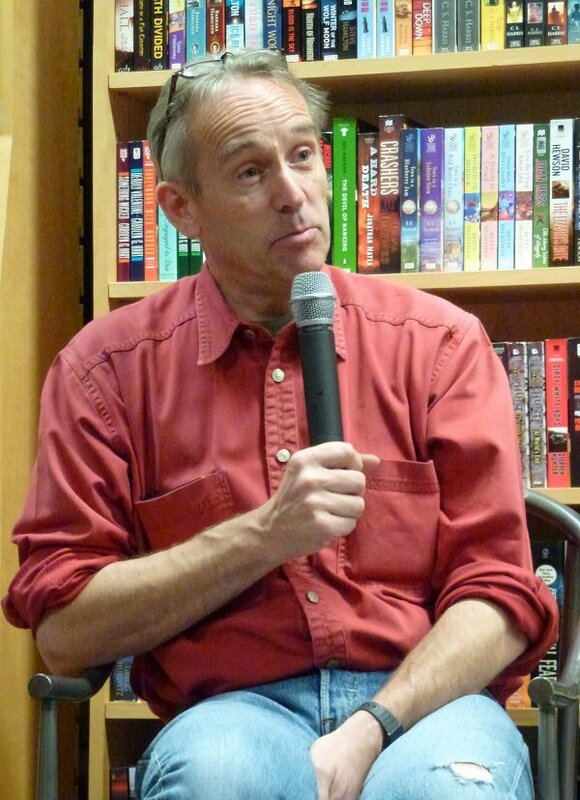 Fforde looked out at us and said, "If I'd been sitting here staring at the ceiling, I would've said Rotating Fan." "You have to plot these out... don't you?" When asked about how he plots his novels, Fforde laughed and said, "No, it all just comes spewing out." Each book begins with a vague idea, but until he begins to write and let that idea evolve, he doesn't have any idea what the book is about or what's going to happen. This method wouldn't work for many writers, but it certainly does for Fforde. He also leaves little on and off ramps in each book that he can pick up and use to create a new one. It was fascinating to hear how his mind works. Naturally Fforde gets lots of mail. Some have pointed out the errors in physics present in his books, to which he replies (often sending along a Certificate of Pedantry) "Is that the only mangling of physics you found? Because if it is, you've missed an amazing amount." Anyone who's read a Jasper Fforde book knows that the man's mind is filled with puns, jokes, and other madness-- and he's not averse to having a little fun with other folks in the publishing industry. Have you ever wondered about those characters with the unpronounceable names? 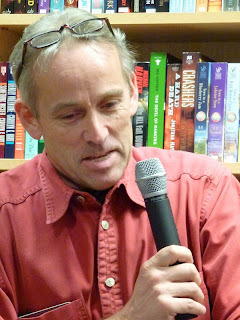 Fforde introduced them especially to bedevil the readers in the audio book business. He's had people call him up and ask him how those names are really pronounced. 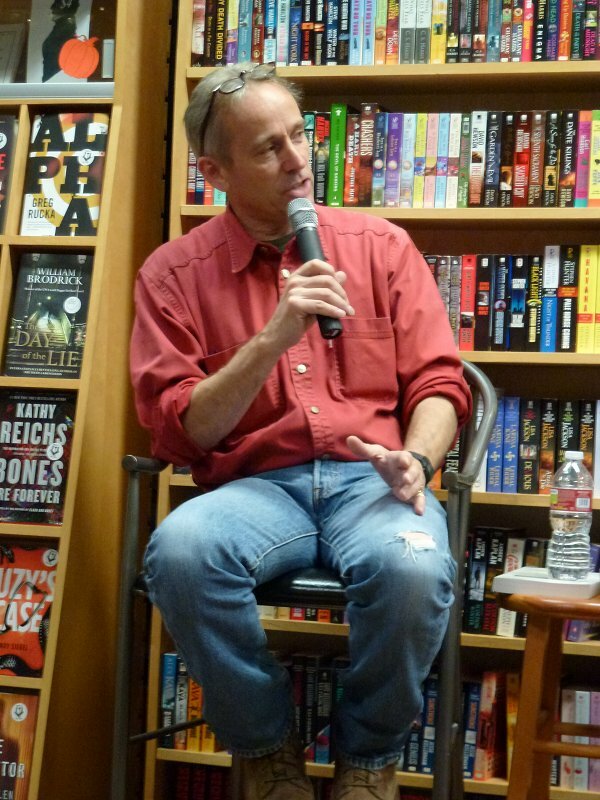 Fforde also talked a bit about his 1300-page website which he calls "after sales service." Back in 2001, Jasper and his wife taught themselves HTML. Everything on the Jasper Fforde website is done by them, and they never take anything down. Fforde kept mentioning how amateurish it looked, but I remember thinking that it had a charming "retro" look the first time I visited it! 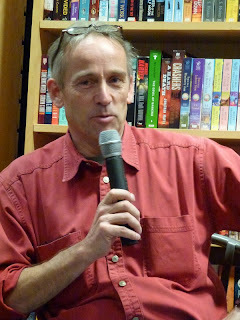 During the Q&A portion of the evening, Fforde was asked about interest in his books by the film industry-- has there been any? "Yes and no," he replied. It's his belief that the best thing to do with the Thursday Next series is to turn each book into six one-hour programs for television, but that would be very expensive, and no one has expressed interest in filming the books that way. I believe that Fforde's books should stay in the realm of the imagination. There is no way any film company could begin to do justice to the readers' own flights of fancy. As Fforde talked about a few of his favorite characters, I found myself remembering a series of short stories that my own mother wrote many, many years ago. The main character was Lad, an Anaconda snake who wore a tasteful gold hoop in one ear... and was a hit snake for the Mob. 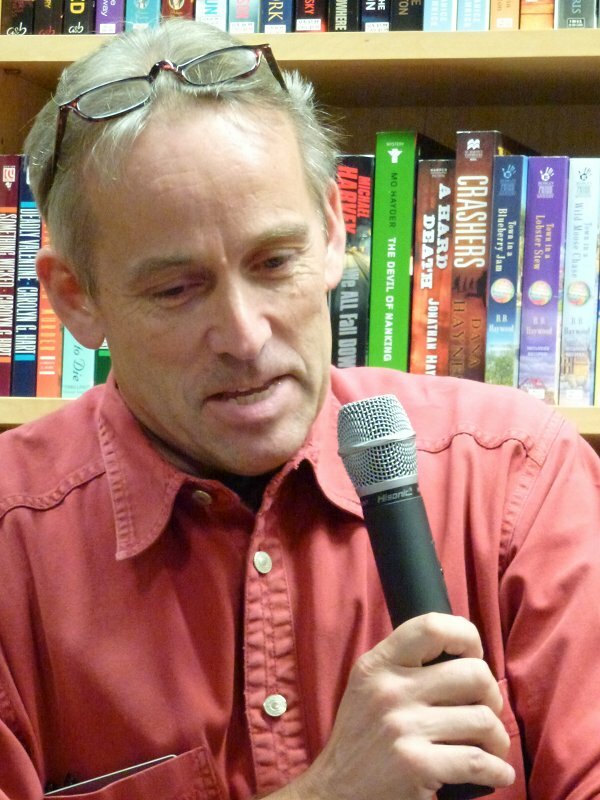 Those stories were so much fun, and I began to picture my mother and Jasper Fforde sitting at the kitchen table, bouncing ideas off each other and coming up with one crazy character, one pun, one silly name right after the other. That vision, and those memories of my mother, made me realize just how blessed we are that this author with his love of literature and the absurd has been able to sweep us off into worlds of imagination and laughter. This was a very special evening, and I left a lot out in my recap because I think you should be able to see and hear it for yourself. Here is the entire event courtesy of the Poisoned Pen and Livestream. (Denis and I show up on this video more than once, but I'm not giving any hints!) Enjoy! Your recaps are wonderful! I bet that was a special evening for you since you love The Eyre Affair so much! I think I spied you in the video. Were you sitting next to the center aisle? I was laughing out loud at the bit about the certificate of pedantry! Thanks for the livestream video. I'd love to have a few of those certificates myself, Jeanne! Cathy - Thanks for sharing this very special evening. All that and humour and a great video too! You're fortunate you were there. Yes, I am. Denis is still smiling about it-- and so am I.
I love the "Certificates of Pedantry"! Fantastic! And how funny about the unpronounceable names - I've wondered if he did that on purpose. How exciting that you were able to see him in person! I've only read The Eyre Affair, but I loved it. It was like The Hitchhiker's Guide to the Galaxy for Literature nerds (and I loved Hitchhiker's Guide). I'm looking forward to reading more of his books. Sounds fascinating. I will watch it when I can. I have not delved into his books, as I'm a bit more conservative on fantasy in books. However, the post is very good and he sounds like a very interesting and funny guy. The point you make about your mother writing about a hit snake for the mob and the thought of her talking to Fforde paints a great picture. I tend to be conservative about the amount of fantasy I prefer to read. 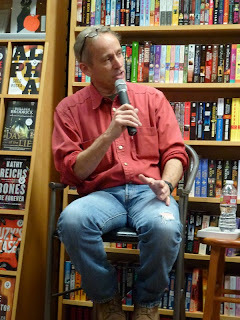 As I sat there that evening, I could just see my mother and Fforde sparking ideas off each other. Almost gave me chills. That thought about your mother and Fforde is lovely, but that your mother could write such a story shows that she had an incredible imagination and sense of humor. What fun! Yes, I did have a lot of fun times with my mother and her imagination. What a brilliant and hilarious guy! I just enjoyed this video so much, laughed out loud often. I don't know about reading his books, but listening to him is a treat.